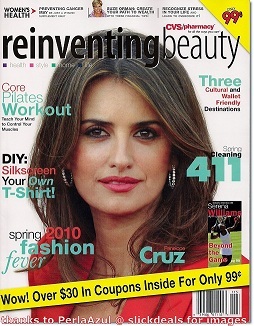 The latest issue of Reinventing Beauty is on the racks at CVS and is filled with $30 in money-saving manufacturer and CVS store coupons. Pick yours up for just $0.99, or look for the standalone inserts on your next trip. I often find them on the rack with the newspapers at my local store. Sandy, did you ask a cashier if they have it? I think every store I’ve been to has them in a different location. My CVS does not carry them and have not in a long time. The manager said they just get what the truck sends and can’t request them. Is this true, you think? My husband works in another town and will check at other stores for me. I hope he can find one.. I found a stack of coupon sheets that have all these coupons listed but were not in a magazine. There’s nothing on it to indicate I needed to pay for it. Now I’m wishing I’d picked up more than one so I could have the Dove coupons!